Everything you need to create a good and fruitful organic garden is readily available to you when you need it, and it doesn’t cost you anything but some time and some effort. All organic gardens start with great soil. Great soil is easy to make, but it needs some time, so start now. Gather vegetable food scraps from your kitchen including bread, tea, coffee and even newspapers. Rake up some leaves or get permission to take them from your neighbor’s yard. Some of your neighbors are even raking them up and putting them at the end of the driveway in bags or trash cans for waste pickup. Grab that stuff it is gold for your compost pile. The last ingredient is manure. Manure for your compost can come from chickens, rabbits, horse, cow, alpaca, sheep or goats, or any other vegetarian livestock. If you don’t have a manure hook up call your county extension office and see if there is someone there who can introduce you to a livestock farmer who needs to get rid of his manure pile. Chances are the manure will be mixed with feed hay and or chip bedding which is a good thing for us composters. Some ranchers will have equipment with which to move piles of manure to the back of your truck or cart. In other cases you may need to bring your own shovel, rake and wheel barrow to move manure to your truck. It is good to find out what tools to bring ahead of time. If you are unable to get your own manure and you are in Saint Lucie County Florida you can call me. I am your friendly neighborhood purveyor of poo, and I will deliver manure to your home for a fee. Please see the Consulting page on this site to find me. Make a coral for your compost. This can be from old fence sections, or wire fencing or hardware cloth, or shipping pallets. Make sure it is at least 3’x3’x3′ or 1meter.x 1meter x 1meter. It would be better to make it a little larger, but for sure no smaller. This coral should be in the shade if you have some. Shade keeps the compost from drying out too fast. No matter how much compost you think you are making I can almost guarantee that you will end up needing more. Make several piles, or one long fence line pile. 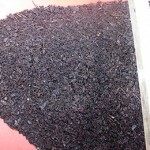 Composting materials shrink as they break down. Your 4x4x4 pile will be less than two feet square when it is garden ready soil. Layer in brown (or carbonaceous) things like brown leaves, straw or old hay, shredded newspapers, and sawdust, with green (or nitrogen rich) things like manures, vegetable kitchen scraps, and grass clippings wetting each layer as you put it down. Each brown layer can be several inches thick. Green layers should be thinner. The pile should get at least 3 feet high. Big piles like what I am describing will begin working efficiently right away unlike small piles. Many people tell me that when they buy commercial compost bins the instructions advise they put the bin in the sun. This they believe is the source of the heat that a compost pile needs to achieve to properly break down weed seeds and certain detrimental bacteria. This is an incorrect notion. 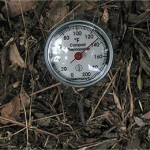 The heat stage or thermophilic stage of a compost pile comes from within. When mesophilic bacteria begin to work on the wastes in your pile they creat heat. They create so much heat that they die or go into dormancy and different types of bacteria come to life to work the pile at about 113 degrees Fahrenheit and up to about 140 degrees. These are thermophilic bacteria and they consume proteins, carbohydrates and fats which make up seeds. Proteins are present in living organisms like ecoli. Those are destroyed in this thermophilic stage as well. Worms and other invertebrates move away from the heat of the compost pile and will come back when the pile cools to begin working there again. While it is desirable for your compost pile to heat itself up there some composting experts who will stop their compost from heating past 150 degrees f. That is they will monitor the temperature of the pile during the thermophilic stage and turn the pile if it gets to 150 degrees. That is because while it is beneficial to have high temperatures in the compost process temperatures that are too high will begin to destroy beneficial organisms and their spores, and slow the work progression in the compost pile. I think therefore that it is not a good idea to put your black plastic composting bin in the sun. It is not going to heat up the right way or for the right reasons, and it will never be cool enough for the compost to move into the very important cooler curing stages. Curing compost begins to develop huge numbers of microbial and invertebrate life that makes up the healthiest soil for plants. Well cured compost brings nutrition, water holding capacity, and disease resistance to your garden vegetables. I want to mention this for the people who want to cook or sterilize their compost before putting it into the garden. Don’t do that. Please stop regarding all bacteria fungi yeasts molds and insects as enemies. Most of these organisms are benign, and those which populate your composted garden soil are absolutely the most desirable organisms in the world! Turning the compost brings air to the pile. When it is raining every day you will need to turn the pile more often to help it to breath and dry out some. When the weather turns dry you will turn the pile less often, once a week works for me in the dry season, and you will have to water it. 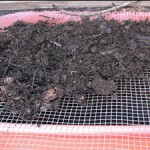 If your compost lacks air or the proper moisture it will slow or stop working all together. An unpleasant odor coming from the pile means it is in need of oxygen, it may be too wet, or be too green, and often it can be both. 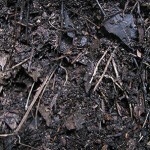 Even unfinished compost should be relatively light, it gets it’s lightness from the carbonaceous or brown materials. Work will start in the green or nitrogen areas of the pile, but once that green starts working the work spreads to the carbon materials as well. This is where turning comes in very handy. Bringing the dark moist working areas up and over top of the carbonaceous materials forces work to speed up (and down). You may have noticed that I am writing a great deal about composting. As I meet more people who are interested in what I am doing I find out that composting is the weak link in their understanding of organic gardening. I would estimate that 80% of my success in my organic garden comes from soil. You can be sure that I spend 80% of my effort in preparing soil for my growing season, and then in growing season I spend most of my time harvesting. My plants take care of themselves. Long ago I was reading an article in an organic gardening magazine and from that article these are the words that stuck with me: “Feed the soil and let the plants feed themselves.” This has been a great and guiding principle for me in my garden. Great amazing nutritious black and fluffy chocolate cake like soil is I am sure the main reason I can grow here so successfully. Now get to work, and make some great soil! This is fascinating and sounds very doable. It is amazing at what we can do with the tools mother nature put right under our noses. A lot of time patience and work and you have magic. Keep this type of post coming, it shows me what I can do without a lot of money. Your posts are always so inspiring…this one especially so. Makes me want to get out there and dig in the dirt : ) after I finish my coffee of course. I am not safe around sharp implements before the caffeine has kicked in. Thanks for your comments Christine and Danny.